Sunday School and Tween Classes — 10:30 a.m. Please note the 5:30 PM Saturday service has been moved to 7:30 PM. The office is on reduced hours for the next week; however, office email and phone messages will still be checked. Please text Father Tim or Jonna 24/7 for any urgent needs. Church of the Apostles 2019 Hop-a-Rama and Easter Egg Hunt is TOMORROW at 9 a.m. This is a FREE community event with face painting, photo opportunities with Mr. Bunny, bounce houses, and an Easter Egg Hunt! Plan to join us and bring the entire family and neighbors and friends, too! Easter egg hunt for kids 2-11 starts at 9 a.m.; the event is open to ALL from 9-11 a.m. Volunteers are needed to make this event a success! If you can volunteer your time on Saturday, arriving by 8:15 a.m. would be most appreciated! There will be a sign-in sheet for volunteers, posted with positions/stations that need to be filled. For more information, please contact Sarah Moreno: youth@churchoftheapostles.net or 214-493-7370. The garage sale fundraiser for the Guatemala Mission Team has been rescheduled. The new date is Saturday, May 4. For more information or to donate items, contact Liia Harmon: liiapatra7@gmail.com 972-966-9063. If you would like give a lily or lilies in memory, honor, or celebration of someone or an event, there are order forms available in the lobby. $10 donation per pot is optional. Please write “Easter Lilies” in the memo space of your check and place in the offering along with the form. Join us for an All Parish otluck immediately after the service in our new Parish Hall every third Sunday at Apostles (unless there is a conflicting event). Our next scheduled pot luck will be the third Sunday in May, on May 19, immediately following the 10:30 a.m..service. We will not have one during Lent or on Easter Day. Mark your calendars and bring your favorite dish to share with everyone, every third Sunday, for food and fellowship at Apostles! To handle the increased number of requests to use our Church & Parish Hall for meetings, events, etc. De Dee Riddle will now be coordinating all requests for facility use and managing a master calendar of reservations. Request forms are available through the Parish office. For questions or reservations, please contact De Dee at: space@churchoftheapostles.net or call 972-489-8837. Also, Church Canons (“rules”) ask every parish priest to remind parishioners during Lent to review personal affairs and estate planning — above all, the importance of having a will and related legal documents. Additionally, with our new building, we have been asked about planned gifts or bequests to Apostles. Yes, we appreciate any such consideration, and we normally advise anyone interested to consult their own financial advisor first. We will have more information on that soon. Whatever your circumstances, however, a last will and testament normally is the bare minimum of wise preparation. If you wish also to pre-plan a memorial or funeral service (or reserve a niche in Patrick’s Place), please contact the office. Saturday, April 20 — Hop-a-Rama at Apostles (Community Event) 9 a.m. — Easter Vigil and Baptism, 7:30 p.m.
Easter Sunday, April 21 — Sunrise Service, 7 a.m. — Holy Eucharist, 8 a.m.
— Festival Eucharist, 10:30 a.m.
Sunday, May 19 – Apostles Youth Movie Night 6:30 p.m.
Sunday, May 26 – Russian Choir visits Apostles 10:30 a.m.
10 students will be graduating this spring and headed for kindergarten in the fall. Both the school and extended care will be CLOSED on Good Friday, April 19. Yard signs are now available in the Parish Office for anyone who can help spread the word about Apostles Montessori Academy! Please take a sign this Sunday after the service and place in your front yard! Daughters of the King Lydia Chapter is sponsoring their annual Coat & Blanket Drive for the homeless in the DFW area. If you can contribute, please drop your new or gently used articles in the collection bin in the lobby. Thank you! Statements for contributions made in the first three months of this year are now being mailed. Please review your statement and if you have any questions, please call the office at 972-462-0234. 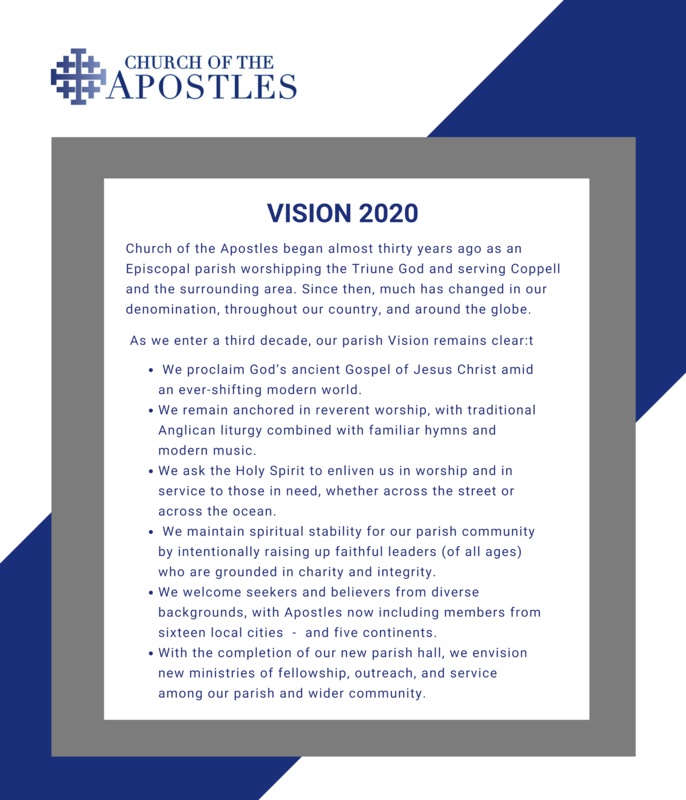 Please see the Vision 2020 and FAQs below as a general update on parish life as we complete our new building and look into 2019 – and beyond! Q: How much have we raised for the new Parish Hall? A: We exceeded our initial $1 million dollar goal, with a total nearing $1.2 million – THANK YOU! Q: Why are we continuing with this campaign so soon after the last one? A: Even with a successful seven-figure result, we always expected to incur some debt. It is important for the church to sustain God’s grace to stay on solid financial footing by keeping this long term debt to a manageable level. Initial estimates from 2014 reflected a desire to carry a long term note between $500,000 and $600,000. Even with careful planning and reduction in project scope, we now expect debt upon completion near $889,000. This is below what both the bank and Diocese approved, but it still is more than we want to carry. Instead of a drawn-out solicitation over a decade, we instead seek to raise an additional $400,000 over the next three years. This will allow us to service debt and focus on a thriving parish without reducing programs. Q: Why are we trying to do this in three years if our loan is written for a longer term? A: We were extraordinarily blessed to find a bank that offered us a three year “interest only” period. We now have 22 months remaining on this reduced monthly payment due. In the meantime, we have received a generous multi-year pledge of $40,000 annually to cover interest payments and allow the rest of the congregation to quickly pay down our principal amount. With these donations combined, a second phase campaign can reduce our debt far more efficiently than a long, lingering effort. If we raise more than $400,000, we will pay down our loan even more quickly! Q: How does my three-year capital commitment affect my regular giving to Apostles? A: As with our original capital asking, your gift should reflect commitment and love in addition to what you regularly give. (We ask everyone to consider increasing 2019 giving by just 1% of their income.) Q: Will everybody in our church be expected to give to this program? A: We ask everyone to prayerfully consider participating. We remain grateful for gifts that were pledged previously but lagged due to unexpected circumstances. We also appreciate gifts from newer members who were not yet at Apostles when first building pledges were made! And to those who completed an initial building donation and now add to it, we appreciate your faithfulness and continued support. Each gift will be different – large and small, cash and in-kind gifts, and possibly planned or estate bequests –working together to do something incredible at Apostles! Q: What should I do if my original commitment has not been completed? A: Most people will choose to “roll over” any remaining balance into a new commitment. This helps people fulfill what they felt God wanted them to do when they made their original commitment, even if circumstances have delayed their best intentions. Q: When will giving begin for the new campaign? A: December, 2018 represents the first month of the new three-year commitments. Q: When will we be asked to return our new commitment card? A: First Commitment weekend is December 1st & 2nd, 2018. This will be the opening week for returning pledges (whether by hardcopy or email or online). Pledges will be received throughout December! Q: Can I donate assets other than cash? A: Yes. Securities, real estate, life insurance and any asset which can be sold readily are welcome. We also will share more information soon regarding planned giving at Apostles. For more information, please contact the church office. Q: Will I be able to change my commitment? A: Yes, your commitment is not a contract. It is a good faith estimate of what you can give, in your “regular” tithes and offerings, as well as to our new Parish Hall. The next Men’s First Thursday Bible Study will be held at the church on Thursday, May 2, at 7:30 p.m. The Bible study is open to all men over 16 years of age. For questions about the group, contact Kevin Williamson or Collin McAvoy at men@churchoftheapostles.net. A memorial service for parishioner JoAnn Shaffer (mother of parishioner Carol Green) will be held at Apostles on Saturday, March 9, at 2 p.m., followed by a reception in the Parish Hall. Your prayers or presence are both invited. Please keep Liia Harmon and her family in your prayers after the death this week of her step-mother Darla Ruth Harmon. A memorial service for Darla will be held this Sunday, February 3 at 2 p.m.at Church of the Apostles, 322 S. MacArthur Blvd., Coppell, Texas. Please keep Cathy Goram and the Goram Family in your prayers after the death of parishioner Steve Goram. Funeral and burial will be on Saturday, December 22, at 3 p.m. at Restland’s Wildwood Chapel, 13005 Greenville Avenue in Dallas. For directions or further information regarding arrangements, please contact the church office at 972-462-0234 or office@churchoftheapostles.net. Contact Sarah Moreno for details and information: 214-493-7370 or youth@churchoftheapostles.net. Church of the Apostles’ Lydia Chapter of Daughters of the King is kicking off its 2018-2019 Program Year with a program centered on “Prayer Changes Me.” The DOK is made up of women who desire a closer walk with the Lord, as supported through the companionship of its sisters. If this is of interest to you, please text Barbara Maley at 214-675-2953. Daughters of the King is an Episcopal women’s order that allows members to assist parish priests and take a vow of prayer, service, and evangelism. Training for participation is required in developing their personal rule of life, and there will be a new training class held soon! If you’re interested in attending training and would like more information, please contact Marilyn Marsh at marnimarsh@yahoo.com or 214-563-2998. During the hot summer months, Daughters of the King is supplying water to SoupMobile Ministries. You can sponsor cases of water by check (please specify “water” in the memo) or by donating online. One case of water is $4.50, five cases is $22.50, ten cases is $45.00, etc. The water price includes delivery to the SoupMobile office. To donate online, go to churchoftheapostles.net, click on “Apostles Giving,” scroll to “Push to Pay” and enter your donation amount. Select “Designation – Other” and in the comments, add “water.” Thank you for supporting this ministry to needy homeless in the downtown Dallas area! Our resident Seventh Day Adventist congregation shares space at Apostles on Saturdays from 9 a.m. to 2:30 p.m. The arrangement includes significant rent, as well as specific guidelines for space usage. We appreciate everyone’s patience and flexibility as we work through practicalities! Please contact the Rector or Wardens or the church office with any feedback or concerns. We are renewing our focus on Lay Eucharistic Visitors who take communion to parishioners who are sick or shut-in, in hospital or rehab, or home settings. Bobbi Henson now coordinates this as part of our healing/visitation ministry. If you or anyone you know has been absent from church due to illness or similar circumstances, please contact Jane Elterman at elterman1@ msn.com to request a visit with Holy Communion. make friends and grow in their faith together! We study lessons in the Bible, learn them in unique ways, and find ways that they apply to us in our day to day life. With arts and crafts, plays, and games, there is always something fun for your kids at our Sunday school and tween classes!” Sunday School and Tween Classes, Sunday morning at 10:30 a.m.
On the Volunteer Page click on one of the blue links that say] “Online background check” or “Volunteer Background Check” (If you are a returning volunteer, sign in). The Sisterhood Bible Study is for women and we meet on the 2nd and 4th Tuesdays from 6:30-8:30 p.m. If you need a book, or you have questions, please contact Susan Deems at 214-415-6323 or susanRdeems@gmail.com. Have you ever looked up on a Sunday morning at church to see a burned out light bulb and thought, “I wonder who’s in charge of that?” Or do you have an idea for a really neat ministry project but wonder whom to tell? Each Vestry member (except Wardens) serves as a liaison to leaders of various church ministries. Members and newcomers alike are encouraged to bring their ideas, concerns, and questions to the Vestry liaison/Lay Ministry leaders by emailing them atvestry@churchoftheapostles.net. Community 12-step group now meets on Monday evenings at Apostles. You might see their members enter the building on Monday evenings. (The group normally now meets and remains in the sanctuary without any effect on activities on the parish hall side.) If you see them enter or exit the building, please respect their privacy. We welcome them to Apostles, give thanks for their godly work, and keep them in our ongoing prayers. If you need to reach office staff — feel free to PUT OFFICE PHONE NUMBERS (Phone:972.462.0234 FAX: 972.393.9102) IN YOUR PHONE. Email and voicemail will be checked regularly. For urgent items, please call the office first. Then if needed, call/text the rector at 214-918-4928. The office email address is Office@ChurchoftheApostles.net. Please use: fathertim@churchoftheapostles.net and delete the outdated revtcherry@juno.com from your contact list. Thank you! On the first Sunday of each month, a standing invitation exists for visitors and members to enjoy lunch with the Band! Lunch will be at 12:30 p.m. at a nearby restaurant—location determined during “head count” after church. Join us for lunch on first Sundays. Questions? Contact Ben Ryan at musicben@churchoftheapostles.net. To honor the sacrament of marriage amid new sensitivities, anniversary blessings may be requested privately from Father Tim. Birthday blessings will continue during the service once a month, as usual. Patrick’s Place Guild oversees maintenance and improvement for Patrick’s Place. Contact Bree Russell at 972-768-2445. Sending out a call for Ushers — often the first face seen when walking through the door at Apostles. Contact Barbara Cervantes at barbcervantes@yahoo.com or 972-539-8890. Questions/Comments on Capital Campaign & Building? Send to building@churchoftheapostles.net. Cursillistas Reunion Meetings: Apostles Cursillistas are invited to the reunion every 1st and 3rd Tuesday evenings at 5:30 p.m. in the parlor. We begin promptly at 5:30 p.m. and are usually finished by 6:15 p.m. Contact Patti Smith at 972-393-9171. Saint Martha’s Guild: Seeking volunteers to help parish families amid illness or crisis, joyful arrivals of new babies, etc. You don’t need to cook a five-course meal! Sometimes we use donated gift cards, which are always appreciated, to pick up and deliver take-out food! Call or text Stephanie Clifton at 469-878-1003. Donations of gift cards for food are always welcome and appreciated! Prayer Requests may be submitted in the “So Glad You’re Here” notebooks or by emailing prayers@churchoftheapostles.net. Please indicate if you want the request listed in the weekly bulletin prayer list — or kept private. If nothing is indicated, your request will be sent only to the Confidential Intercessors. Names placed on the weekly prayer list normally will remain for eight weeks. Please send to office@churchoftheapostles.net or vestry@churchoftheapostles.net.